Chronic pain, depression and difficulty being physically active are common problems for many people with SCI that have a negative effect on overall quality of life. These problems are also very complex and difficult to treat in the current health care system. Our study aimed to improve treatment for these conditions by testing a new collaborative care approach. This was a 16-week, single-blind, randomized controlled trial comparing collaborative care to usual care for improving physical activity, chronic pain and depression. In this model, a specially trained care manager worked with the patient and his or her rehabilitation physician and a team of expert advisors to enhance outpatient healthcare delivery. This method has been found to work well with patients who have chronic conditions such as diabetes and heart disease. The NWRSCIS joined seven other model systems on this study exploring the wheelchair equipment and services provided to individuals with SCI of different ethnic, economic and social backgrounds. 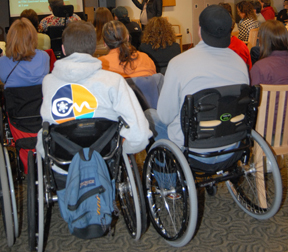 The goal was to improve wheelchair services for all individuals with SCI and, as a consequence, improve overall health and participation in life. This study was directed by Michael Boninger, MD, director of the University of Pittsburgh Model Center on Spinal Cord Injury. Participants were drawn from individuals who were already enrolled in the National SCI Model System Database through their participating model systems. Many people with SCI tell us that the first year after discharge from rehabilitation is very difficult because they have so many questions and new problems to solve but don’t always know where to find the information they need. To address this, we designed a study to determine whether providing regularly scheduled telephone follow-up calls to people with SCI after discharge can help them get the care they need, solve problems that arise, and avoid the medical complications that people often experience during their first year after SCI. Jeanne Hoffman, PhD, was the principal investigator for this study. Findings from the study, completed in 2011, will be published and posted here. The effects of venlafaxine XR (Effexor XR) after SCI – "PRISMS" (Project to Improve Symptoms and Mood after SCI). One out of five people with SCI report problems with sleep, poor energy, low mood, loss of interest and appetite changes. These symptoms may result in part from stress-related changes in brain chemistry. Antidepressant medications such as venlafaxine XR (Effexor XR) are designed to rebalance brain chemistry and improve these basic biological functions. Despite widespread use of antidepressants, they have never been proven to be effective in people with SCI. We studied the effects of venlafaxine XR on these symptoms and on pain in people who were at least one year post-SCI. Participants were randomized to receive a 12-week course of either venlafaxine XR or a placebo. Those who received placebo and remained symptomatic at the end of the trial are offered free treatment with venlafaxine XR. The study is now closed. Findings will be published and posted here. There are many myths about adaptation to SCI, such as the belief everyone must go through a grief process or everyone gets depressed. We hope to improve how we assist people with SCI by gathering information on what people experience after SCI, what treatments they receive and how they view their own health physically and emotionally over time. 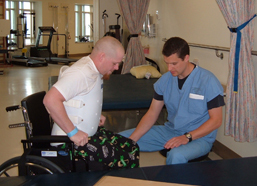 This study follows people from inpatient rehabilitation to one year after injury. Chuck Bombardier, PhD, is the principal investigator for this study. Findings from the study will be published soon and posted here. Collaborative Upper Limb Pain (CULP-SCI). This was a three-site collaborative study centered at the University of Pittsburgh. This study examined the manual wheelchair propulsion and transfer techniques used by people with SCI that over time can contribute to the high incidence of disabling upper limb pain in this population. The Seattle arm of the study was directed by Dr. Michael Chang, associate professor in the Department of Rehabilitation Medicine. 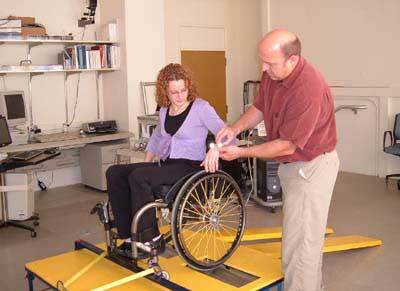 In the UW's state-of-the-art Human Motion Analysis Laboratory, subjects underwent initial biomechanical studies that measured the mechanics of their wheelchair techniques. Following that, subjects participated in periodic telephone interviews that monitored upper limb pain and disability over a five year period. Data collection is complete but analyses continue and results are being published. See the list of publications from this study. Directed by Sohail Mirza, MD, associate professor in the Department of Orthopedic Surgery, this study is examining spinal cord injury cases that occurred between 2003 and 2005 to determine whether earlier spine surgery results in better outcomes than later surgery, how much improvement occurs with earlier intervention, and what is the complication rate. This study hopes to shed light on the controversy over whether it is preferable to perform surgery very soon after injury, before further damage occurs, or later, after the patient has stabilized and risks from surgery have declined.